Merry Christmas!!! I made this 4 Layer Dessert for Christmas and it was a hit in our family. My parents had never tried this before, but loved it. My sister, who is very strict in what she eats even had a slice! Below, is a funny story about how this dessert means so much to my husband, Matt. Paula’s 4 Layer Dessert is one of Matt’s all-time favorites! When Paula, Matt’s mother, would come down to watch him play football at Texas A&M, she would bring this dessert for him and his two roommates, Chance and Trevor. After a couple of trips to College Station, Trevor started craving Paula’s dessert and requested the recipe. Trevor then started making this dessert for the three roommates. One evening after Trevor made the 4 Layer Dessert, he and Matt went to lift weights. By the time they arrived back home, Chance, the other roommate, had eaten the entire 9 x 13-inch pan, washed it, dried it, and put it back in its place. When Matt and Trevor returned, they looked all over the kitchen for the dessert. They had no clue where it had gone! Eventually they found out what Chance had done, and were furious! Still to this day the story is told over and over again. Chance is quite a bit larger than Matt and Trevor, so they choose their fights wisely. (Chance went on to play in the NFL for the Houston Texans.) It is a tradition that whenever Matt’s roommates come visit, Paula’s 4 Layer Dessert is always on the menu! Cream together the butter, flour, and chopped pecans. Press into 9 x 13 inch pan. Bake for 15-20 minutes in a 350 degree F oven. Beat together cream cheese, cool whip, vanilla, and powdered sugar. Whisk together instant chocolate and vanilla pudding mix with 3 cups cold milk for 2 minutes, until thick. Pour over cream cheese layer. Garnish with Hershey’s chocolate bar shavings. Combine butter, flour, and pecans together and press into a 9 x 13 inch baking pan. Bake for 15 minutes, then cool. Combine cream cheese, powdered sugar, 1 to 1½ cups Cool Whip, and vanilla extract together. Pour over cooled crust. Whip together chocolate and vanilla instant pudding mixes with cold milk according to package directions. Pour over cream cheese layer. 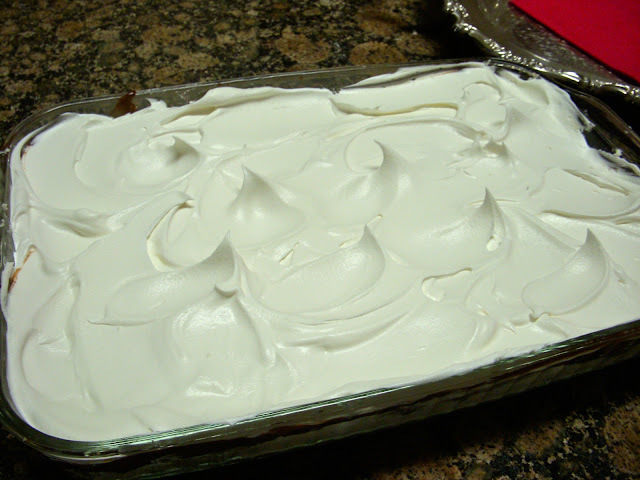 Top pudding layer with Cool Whip. Garnish with Hershey's chocolate bar shavings for decoration. Chill and keep refrigerated. 4 Responses to "4 Layer Pudding Dessert"
My families favorite dessert! Growing up we had a version of this just with banana pudding and bananas, however my little family prefers this version, so glad I found it! My 5 year old has requested it for her birthday! Thanks! So glad to hear. This is a winner for sure!